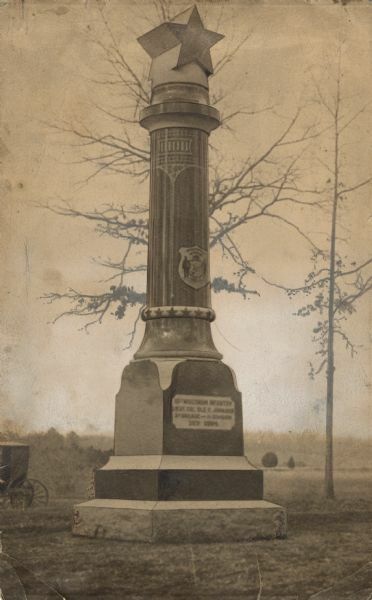 15th Wisconsin Monument at Chickamauga, 1920 ca. 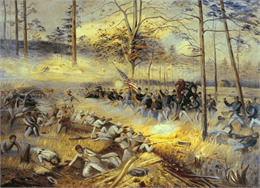 The defeat at Chickamauga, Georgia, in the fall of 1863 left Union troops pinned inside Chattanooga, Tennessee, and temporarily halted the Union advance into the heart of the Confederacy. In early August 1863, Union forces were ordered to advance into the upper Tennessee River Valley and take Chattanooga, Tennessee. After capturing it in early September, Union generals pushed further south. They encountered their enemy 10 miles outside the city, across the state line in Georgia. For three days, 58,000 Union troops faced off against 66,000 Confederates in the war's second-bloodiest battle (after the Battle of Gettysburg). The opposing lines were six miles long. Much of the fighting occurred in woods so thick that at times neither side knew the precise location of the other. Sometimes commanders could not find their own troops. Strategic maneuvers were difficult and surprise encounters were common. Over the course of three days, Union generals' misinformation combined with bad judgment enabled the Confederates to push them back into Chattanooga. The 1st, 10th, 15th, 21st, and 24th Wisconsin Infantry regiments along with the 1st Wisconsin Cavalry, and the 3rd, 5th, and 8th Wisconsin Light Artillery batteries were engaged in some of the fiercest fighting. 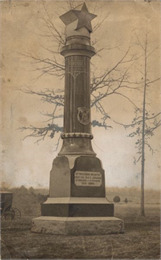 The chaplain of the 1st Wisconsin Infantry reported that 80 percent of its men were killed, wounded, or taken prisoner. The 15th Wisconsin Infantry, composed almost entirely of Norwegian immigrants, was led on the field by Colonel Hans C. Heg, who was killed in action. The 21st Wisconsin Infantry found itself surrounded. Lieutenant Colonel Harrison C. Hobart was among those captured and sent to Libby Prison. He led more than 100 prisoners in a daring tunnel escape the following February.